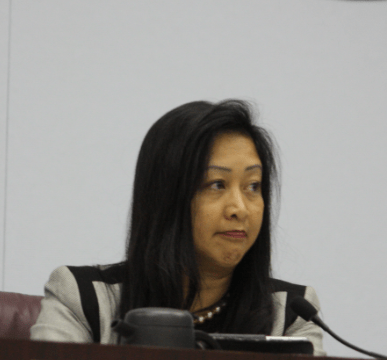 Controversy surrounded the July 19 ABCUSD Board Meeting as Board Member Lynda Johnson attempted to block the appointment of long-time committee member and ABCFT Union Representative Gavin Riley, throwing the normally tranquil meeting into chaos. The controversy began when Vice President Christopher Apodaca nominated Hugo Enciso as his representative to the ABCUSD Facilities Committee. Riley has been affiliated with the ABC for over 50 years, 38 years as a teacher, with the remaining as a part-time teacher while volunteering and serving on several un-paid ABC committees. But Johnson apparently was not aware of the Rules of Order. After the move to amend, Board President Chen asked for public comment, a surprised Johnson vehemently objected. “We can have public comment”? Johnson asked. Chen indicated that it was proper to allow comment because Johnson added an amendment to the agenda item, a discussion ensued and it was ruled that public comment was allowed. Richard Hathaway spoke first and confirmed the Board’s ruling that since Johnson made an amendment, public comment is allowed. Hathaway then slammed Johnson for her singling our Riley and then the ABCFT Union. Hathaway said, “This is disgusting. Board member Johnson has also attempted to have me thrown off the Facilities Committee. Riley has been on Finance and Audit Committee for years, he was a teacher for 38 years, long-time community member and volunteer, you question Gavin [Riley] you question the ABCFT. He is a good man; you [Johnson] do not want people on committees who do not agree with you, that’s wrong. ABCFT should be able to appoint people who best represent their members. Riley then calmly took the podium and spoke about his 50 years of service to the ABCUSD, 38 years as a teacher, 11 years with the union in various positions. Tse then asked Superintendent Dr. Sieu to look into the matter. Sieu indicated the Board can deviate from bylaws but it must be voted on by the entire Board. VP Apodaca then interjected with a “call to question” to appoint Enciso, which stops discussion on the current issue. Board Member Maynard Law, who was teleconferencing, seconded his motion. The motion passed with Tse and Johnson voting no. The Board was then forced to waste more time and go back to discuss and vote on Johnson’s original amendment to table Riley’s appointment. A lighter moment ensued as Enciso, who had stood up when VP Apodaca nominated him at the beginning, was still standing. Apodaca told Enciso he could sit down with the entire room bursting out in laughter. The ensuing discussion made it clear that Johnson did not want Riley to serve on the FA committee. Given that stance, her proposed amendment to table his appointment was voted down 4-3. Apodaca, Chen, Law, Mendoza voted no to approve the amendment, with Tse, Johnson, and Yoo voting yes. Rules of Order allowed public comment once again with Hathaway immediately submitting a comment card. Trying to calm the situation, Johnson then backtracked and thanked Riley and Hathaway for their service. Rebuking Johnson, Tse then wanted to nominate Riley as her FA member but was told that she had to wait. Tse then asked for a vote. Link to the July Meeting being referenced.